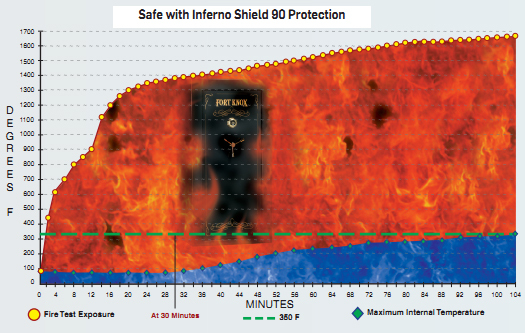 Fort Knox”s Inferno Shield 90 is tested to keep the inside of the safe under 350 degrees. UL Listed “C” rated fireboard insulation is used on all 6 sides and behind the hinges to eliminate hot spots or hot pockets. 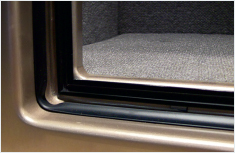 Heat sensitive expanding fire seal expands to seal the safe around the entire door on all Fort Knox safes. In addition to the high grade UL listed fireboard and deep bend box, a dead air space is manufactured into the safe which acts as a thermal barrier, much like a thermal pane window, to give added protection. This design provides fire protection at 1680 degrees in 90 minutes. Superior Fire Protection Gets Upgraded! 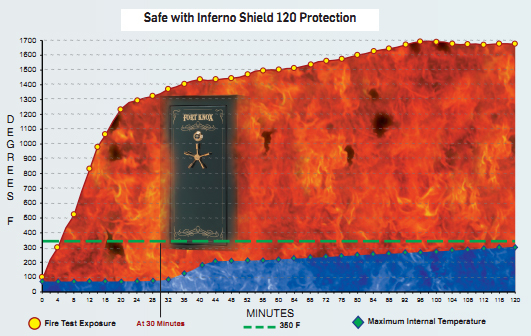 Fort Knox Inferno Shield 120 fire protection gives you the option of adding more fireboard insulation to achieve a fire rating that only commercial safes can attain. This additional fire protection will cause a slight decrease in the interior capacity of the safe interior, but it is well worth it! 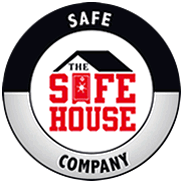 Protect your most prized possiones by adding the most valuable safe option; the Reinforced Fire Liner, and have your safe rated at 1680 degrees in 120 minutes. Locked, sealed and ready to bock the worst that flames have to offer. Seal 1. Heat activated Palusol swells to seal the safe door during a fire. Seal 2. A smoke seal is critical to protect your possessions until the expansion of the palusol occurs.